All cart traffic should enter and exit the cart paths at a 90 degree angle. 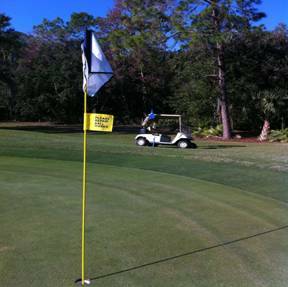 Handicap flag carts must park at least 30 feet from the teeing ground. Handicap flag carts must be parked by the blue post located on the side or back of greens. 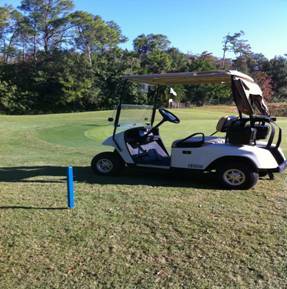 The cart is to be parked in a position that the blue post is in between the cart and the green. At no time should any golfer remove any ropes or barricades, which have been installed on the golf course for traffic control. In case of inclement weather or certain golf course conditions (Phase 3 water restrictions), carts may be restricted to cart paths. NO HANDICAP PRIVILEGES will be extended at that time. If cart only is limited to selected holes, Handicap Privileges will NOT be extended for those designated holes.